In an ideal world, we would never have to use a drill on a tooth. Prevention is the goal to which we strive, and ultimately is the key to the success of any treatments that we may perform. Our team believes that every one of our patients deserves a complete and thorough examination, a review of the findings of this examination, and the answers to any questions that they may have. We believe that, if we are to be successful with our treatment outcomes, everyone needs to understand the circumstances of their dental condition and be active participants in their care. Beyond this, our team applies the principle of “Would I do it on myself or my family members?” Only when this question can be answered with a definite ‘Yes!’ will a treatment plan be recommended. In short, our goal is to provide our patients with the best that modern dentistry has to offer in a comfortable, caring environment. 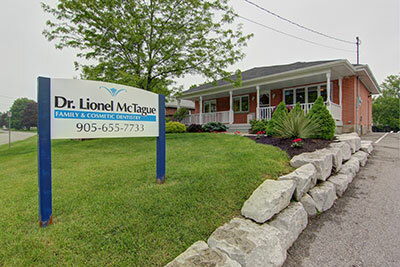 Dr. Lionel McTague was born and raised in Scarborough, ON. He attended the University of Toronto, beginning his undergraduate studies in biochemistry and physiology. His aspiration was to practice dentistry, however, and he subsequently attended the U of T’s Faculty of Dentistry, obtaining a Doctor of Dental Surgery degree in 1991 and being honoured with induction into the Omicron Kappa Upsilon honour dental society as one of the top four students of his graduating class. After graduation, Dr. McTague was accepted into a General Practice Residency at St. Michael’s Hospital in downtown Toronto, a programme operated through U of T’s Faculties of Dentistry and Medicine. He gained valuable experience in several areas from this programme, notably in oral surgery, trauma care, radiology and pathology, anaesthesia, and remote care on First Nations reserves in northwestern Ontario, as well as exposure to several disciplines within medicine. Upon completion of the residency programme, Dr. McTague went into private practice in Port Perry, ON. He moved his practice to Brooklin, ON, in 2004. Dr. McTague was recruited in 2000 by the University Of Toronto Faculty Of Dentistry to be a part-time Clinical Instructor and Clinical Co-ordinator, instructing 3rd and 4th year students as a member of the Department of Restorative Dentistry. Dr. McTague has been on staff in the Department of Surgery at Lakeridge Health Port Perry Campus (formerly Community Memorial Hospital) since 1993, providing dental surgery services for paediatric and adult patients, as well as special needs patients and the medically compromised. Whitby ITI (International Team for Implantology) Study Club. Dr. McTague resides in Port Perry, Ontario with his wife, daughter and two sons. When not cheering on his children at the hockey rink, swimming pool, baseball diamond or soccer pitch, he enjoys playing recreational hockey and soccer, the occasional game of golf, and putting his private pilot licence to use.